Retired SketchUp Blog: Who is Steve Oles? Whenever I teach someone SketchUp, the first thing I like to do is introduce our scale figure. Functionally, these 2D face-me components help orient you to a model's scale and perspective. More personally, the scale figures we’ve chosen for our default templates have always been members of the SketchUp team. For us, it’s a fun way to recognize someone who’s helped make SketchUp what it is. In SketchUp 2015, our default scale figure isn’t one of our great colleagues, but one of our great friends: Steve Oles. 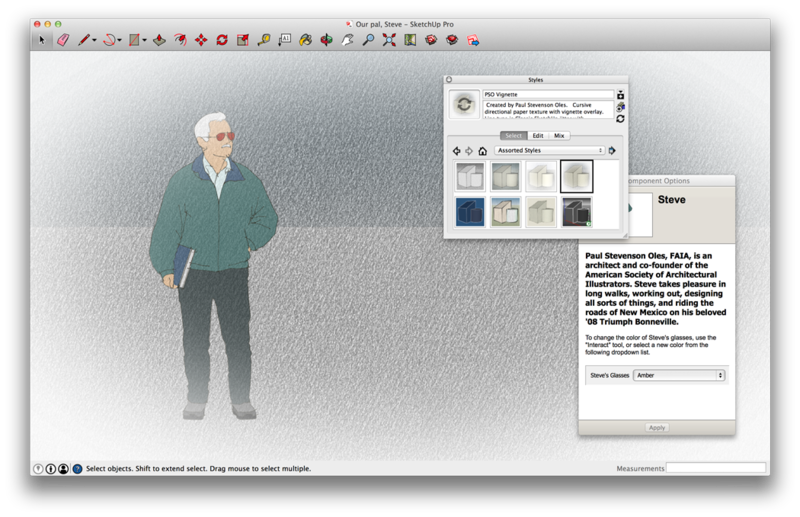 SketchUp 2015’s default scale figure “Steve” rendered in the PSO Vignette style that he helped create. If you’ve come to a 3D Basecamp, you may have met Steve or even sat in on one of his unconference sessions about hybrid drawing for architectural illustration. The name might also be familiar if you’ve ever used one of the PSO styles in SketchUp (Steve is short for Paul Stevenson).